Who will be the iTunes of streaming music? This week's big news came from Amazon, whose US operation has unveiled a cloud-based music service. Customers get 5GB of online music storage for free, rising to 20GB if they buy an Amazon MP3 album, and there are web-based and Android music players so you can listen to your stuff anywhere. The big surprise is that Apple didn't do it first: after all, a cloud-based iTunes "digital locker" has been rumoured for ages. Online music is becoming increasingly crowded. Microsoft's there with Zune Pass, Sony has Music Unlimited and in the UK at least, there's Spotify. Those three services demonstrate one of the big problems with streaming music: you need to get permission from the record companies, and you need to pay them for that permission. Getting that permission for the right price can be a problem. Rumours suggest that the launch of Google Music, another cloud-based offering, has been stalled because Google can't hammer out an agreement with the labels; the US launch of Spotify has been repeatedly delayed for what we're told are similar reasons. Amazon's solution is simple: tell the record companies to get stuffed. The firm is apparently embarking on a charm offensive to win the record labels' hearts again, but as far as the cloud service is concerned Amazon's message to them has been consistent: streaming customers' own music doesn't require a licence. Amazon has a point. You don't pay extra to stream music from your PC to your TV, or to copy MP3s from an external hard disk - so why should you pay to stream MP3s from music you've already paid for? Amazon's service doesn't do the uploading for you, so it's essentially offering you a bit of hard disk space. What you do with that space is none of the record labels' business. 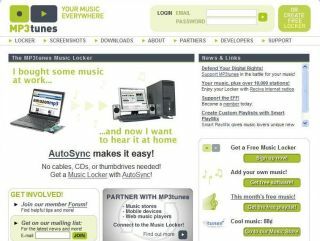 It's an argument we've heard before, and the record companies don't like it: as TechRadar's Gary Marshall points out, "MP3.com's Michael Robertson used it to justify his MP3tunes digital locker service, which is currently being dragged through the US courts by EMI." That legal action has been going on since 2007. EMI's counter-argument is that MP3tunes doesn't own the music it streams, and therefore it isn't allowed to do anything with it. Robertson's been at this for a while: he launched MP3.com in 1997 when most people didn't even know what an MP3 was, and MP3tunes.com has been around for five years. So it's not surprising that he can't resist a little dig at Amazon: "If you use MP3tunes you're already familiar with what Amazon offers because it looks just like version 1.0 we launched several years back," he writes. The fall-out from Amazon's announcement will be significant. As Robertson says, "If Amazon can make music, including purchases, listenable everywhere without paying the major labels or publishers then Apple and Google must do the same." That might explain why one of Robertson's allies in his court battle with EMI is Google. As he says, "If Amazon can launch an unlicensed service without any repercussions, paying the record labels no money, then what motivation would there be for Google or Apple to enter into a licence?" "What we're seeing here is a war on two fronts," Gary Marshall writes. "We have tech firms battling with record companies to work out how the future of music will be delivered and who pays what, and we have tech firms battling one another to be the iTunes of streaming music."